This is a week that parents and children look forward to each summer. The children will learn memorable songs, do some fun choreography, and take pride in presenting a play that will be enjoyed by the whole community. 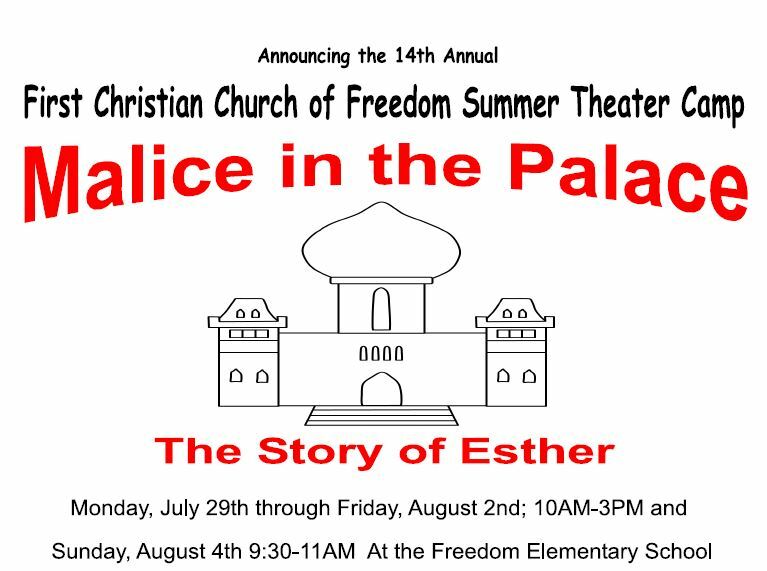 This year’s play will be Malice in the Palace: The Story of Esther. It requires a team effort to put on a play so please, when you register your child, plan for him or her to be there for all of the rehearsal week and for the Sunday performance. Children should bring a lunch with beverage and an afternoon snack each day. Casual clothing is best but please, no flip-flops or open-toed shoes. The cost is $15 for the week. Scholarships are available. Register early so that you can receive a CD and learn the songs. Children must be at least 7 years of age. Registration form is available by clicking here. For further information contact Carolyn Olzerowicz at (603) 569-5711, or at colzerowicz@gmail.com. See the play at the Freedom Elementary School. Dress rehearsal will be open to the public on Friday, August 2 at 2:30 PM. Main performance will be on Sunday, August 4 at 10:00 AM at the FCCF Old Home Week worship service.